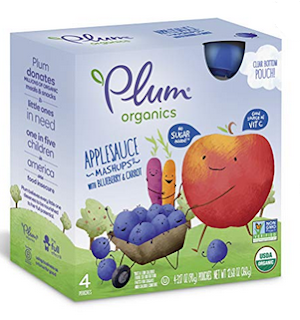 Amazon has a 25% off coupon for a 6 pack of Plum Organics Mashups, Organic Kids Applesauce, Blueberry & Carrot, 3.17 ounce pouch, 4 count. I think you get 24 in all. Without the coupon these are $15.05. The coupon saves you $3.96. Fruits and veggies are mashed into purees you can squeeze and eat! They have all the natural sweet of your favorite fruits and some extra pow from colorful veggies. The shelf stable pouch retains freshness, flavor and nutrients of purees and offers easy feeding with a convenient, portable and resealable no mess solution for kids. Certified organic, nutrient rich, free of high fructose corn syrup, trans fats, and artificial ingredients.